Some long-forgotten traditional skills are still thriving in pockets of London, says Olivia Temple. Tucked away at the very end of a cul-de-sac in west Kensington is the only working smithy left in London. Capricorn Architectural Ironwork's forge has been here since 1831. 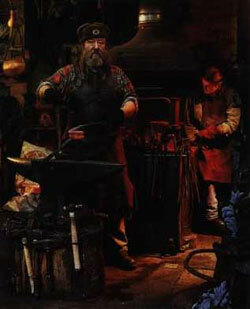 Forge master Dave Townsend, a huge bear-like man with a beard and a leather apron down to his ankles, looks every inch a blacksmith. His business partner, Wendy Alford, designs, draws and hand-colours their ironwork designs as well as working at the forge herself. There is a team of 11 blacksmiths, and commissions have included art nouveau balustrades for Harrods, a huge gothic spiral staircase for the film set of Alien 3, restoration of the British Museum's gates as well as sets of hand-forged utensils for Tudor kitchens. When working on restoration projects, the blacksmiths use the techniques that would have been available at the time the original piece was forged. Capricorn has a showroom and shop where you can see its designs. Capricorn Architectural Ironwork, Tasso Forge, 56 Tasso Road, W6 8LZ, (0171) 3814235. Showroom: Iron Age, 25 North End Parade, North End Road, W14 OSJ, (0171) 603 1282. Antonis Cardew has an aura of the poet about him. His Southwark workshop is on the first floor of an old courthouse building, which dates from 1740. Here, the smell of woodsmoke from Antonis's small stove mingles with the fruity scent of his favourite apple and chestnut wood. A purist, Antonis eats off wooden plates which he has turned himself from trees wounded or brought down by storms. These are stacked in crooked splendour, each one used for specific dishes so that flavours don"t taint one another. Antonis has used a steam-bending technique to design an ash wood chair with a woven lattice seat. 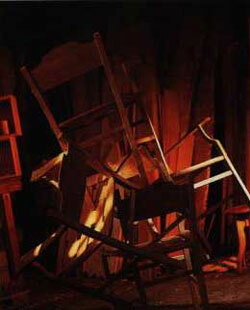 As the wood is thin and strong, the chair "moves" with the floor - it doesn"t wobble or rock even on uneven surfaces. His commissions, which have included a contract to make CD boxes for The Conran Shop, are usually worked in English hardwoods as well as in Spanish chestnut and French oak. Preferring to let the natural grain and warmth of the wood speak for themselves, Antonis refuses to stain or cover his wood furniture in any way.